For a roofing contractor that offers the last roof you’ll ever need to buy, look no further than ABC Seamless. Our durable steel roofs are among the toughest on the market and will be a reliable line of defense against heavy weather, extreme temperatures, and strong winds. Steel roofs from ABC Seamless differ from many of the other products available because they won’t degrade like asphalt shingles, chip or crack like slate or clay tiles, or require a high level of maintenance like wood shakes. When you choose us as your roofing contractor, you’ll never need to second guess the quality of your roof, because each of our steel roofers is extensively trained and follows precise procedures to ensure the job is completed properly. This commitment to superior workmanship has helped us to earn a Top 200 Exterior rating from Qualified Remodeler as well as an A+ rating from the Better Business Bureau. 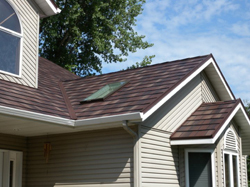 To learn more about how we can be your roofing contractor, contact us today. We serve Omaha, Hastings, Grand Island, Kearney, and many other surrounding communities. Along with roofing, we also install house gutters, exterior siding, soffits and fascia, composite windows, and much more.